I would like to visualize the vertical profiles of different LiDAR point clouds in different forest types. I have extracted the z-values from the LiDAR files with lidR and put them in a dataframe with 20 columns for each plot and ca. 200.000 rows. I would like to create a jitter histogram to illustrate the differences between different forest types and their structure. However, I feel like I could do with less than 200.000 points per column. Any suggestions how to reduce the points in a way that it preserves the overall trend? I am not sure if I am free to share the data I am working on publicly, but since laz files are the same in their architecture, I guess it is still understandable if you have one laz file at hand. Up to this point, this gives me a data.frame where each column represents one plot and the data in each column are the height values of each point in the plot. Take advantage of catalog from lidR package. It will allow processing files sequentially (in chunks), using multiple cores and directly outputting/writing results to files without returning them into R's memory (among other features). I would like to visualize the vertical profiles of different LiDAR point clouds in different forest types. 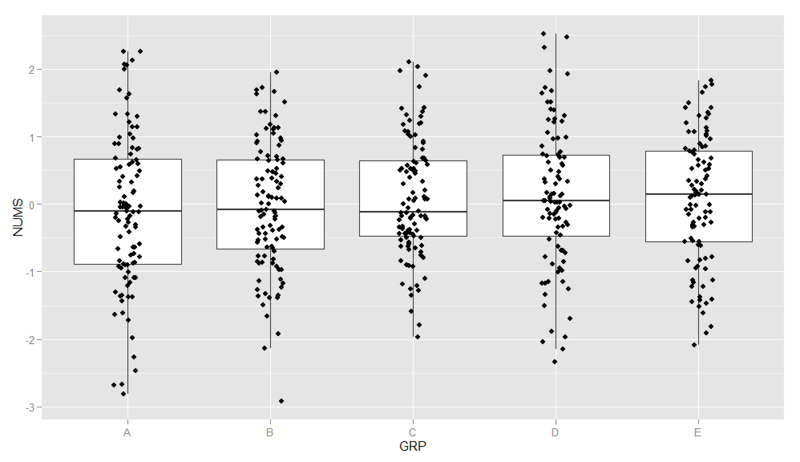 I don't think jittered points (plotted with or without boxplots) is a good option for visualizing distribution of highly dense data, even using some transparency among points. Usually, the point cloud will look like a solid geometry block in the chart. Here is a post in Stack Overflow about jittering points to deal with overlapping points. 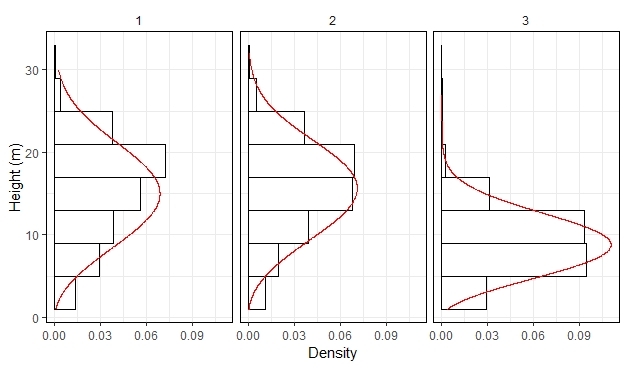 Boxplots alone are ok, but I prefer using histograms and probability distributions (aka probability density functions - pdf) for representing vertical profiles. Here is a reproducible example using LiDAR datasets from the lidR package. In this example, every dataset is considered to be a plot. # - normalized Z values from LiDAR LAS files. 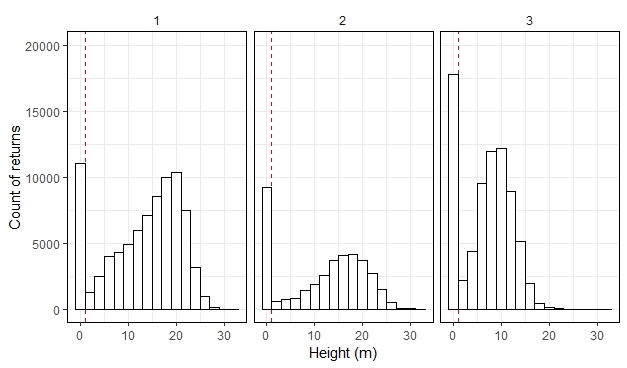 #Exploratory analysis of heights distribution. As our goal is to visualize and model vertical profile from forests, we should remove 'ground points' from the analysis (those are represented in histograms by the bin -1 to 1 m; cutting up from one meter will remove other types of noise as well, such as debris). #Filter out ground points (Z < 1m), because the objective is to visualize profiles from forest types. In our example, after removing 'ground points', we got only unimodal distributions (has one peak) which is good because it is easier to model and use than multimodal distributions. 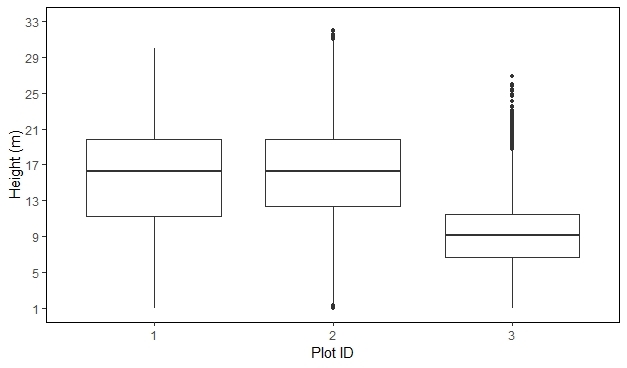 Before going for the vertical profiles, let's visualize our data in a boxplot as suggested in question. Finally, we are going to fit Weibull pdfs as a model to describe point's height distribution. Here, we are going to fit distributions and analyse them visually. On real analysis you will want checking the fit with QQ-plots and other statistical tests. #Get vertical profiles based on Weibull pdfs. # Calculate Weibull densities to Z values. The advantage of capturing a vertical profile in a distribution is that we summarized height values from ~200k points in a theoretical function with two parameters. For example, in the left panel, the scale parameter is equal 17.1 and the shape parameter is equal 3. If one is not familiar with the Weibull parameters, I explain how to interpret them here. Not the answer you're looking for? Browse other questions tagged r lidar visualisation profile forest-ecology or ask your own question. How to clip from a point layer using postgis?